The eight-foot underwater touchscreen features specialized dolphin-friendly "apps" and a symbolic keyboard to provide the dolphins -- which are intelligent and highly social -- with opportunities to interact with the system. Credit: The Marine Mammal Communication and Cognition collaboration (m2c2.net). Using optical technology specifically developed for this project, dolphins at the National Aquarium in Baltimore, MD, are at the center of research from an interdisciplinary team from Hunter College and Rockefeller University. 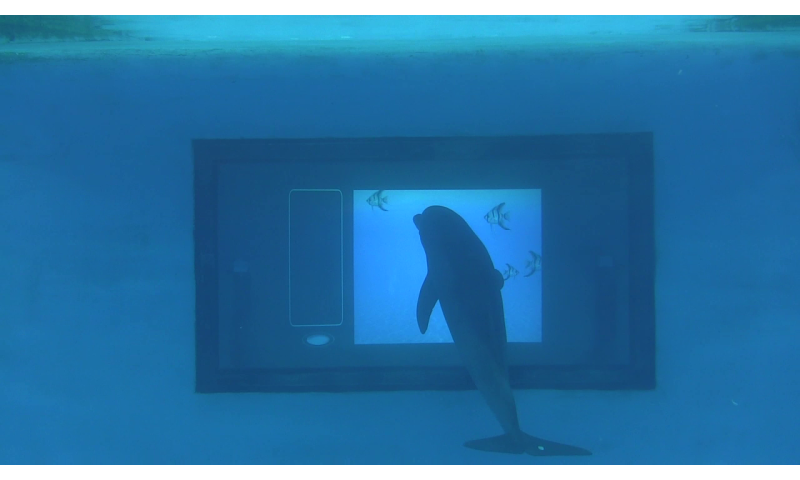 The system involves an underwater computer touchscreen through which dolphins are able to interact and make choices. The system, the first of its kind, will be used to investigate dolphin intelligence and communication by providing them choice and control over a number of activities. Researchers believe this technology will help extend the high-throughput revolution in biology that has brought us whole genome sequencing and the BRAIN project, into the field of animal cognition. The eight-foot underwater touchscreen features specialized dolphin-friendly "apps" and a symbolic keyboard to provide the dolphins—which are intelligent and highly social—with opportunities to interact with the system. 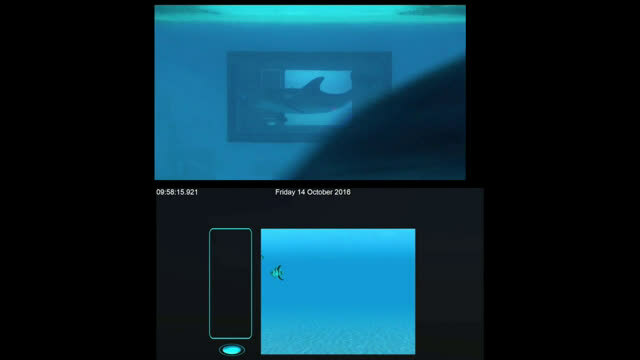 To make the system safe for the dolphins, the touchscreen has been installed outside an underwater viewing window, so that no parts of the device are in the pool: the animals' touch is detected purely optically. While the research is still in its early stages, the team has embarked on studies aimed at understanding dolphin vocal learning and communication, their capacity for symbolic communication, and what patterns of behavior may emerge when the animals have the ability to request items, videos, interactions and images. The interdisciplinary research team is comprised of Diana Reiss, a dolphin cognition and communication research scientist and Professor in the Department of Psychology at Hunter College; biophysicist Marcelo Magnasco, Professor and Head of the Laboratory of Integrative Neuroscience at Rockefeller University; Ana Hocevar, a postdoctoral research scientist; and Sean Woodward, a doctoral student, both in Magnasco's lab. "We hope this technologically-sophisticated touchscreen will be enriching for the dolphins and also enrich our science by opening a window into the dolphin mind," says Reiss. "Giving dolphins increased choice and control allows them to show us reflections of their way of thinking and may help us decode their vocal communication." Reiss is known for her earlier work demonstrating "mirror self-recognition" in dolphins (and elephants) as well as a prior dolphin study that pioneered the use of an interactive underwater keyboard system and demonstrated their capacity for spontaneous vocal imitation and self-organized learning. "It was surprisingly difficult to find an elegant solution that was absolutely safe for the dolphins, but it has been incredibly rewarding to work with these amazing creatures and see their reactions to our system," says Magnasco. "It has always been hard to keep up with dolphins, they are so smart; a fully interactive and programmable system will help us follow them in any direction they take us." "The interactive system was designed to engage the dolphins without requiring explicit training. It is an open system in which the dolphins' use of the touchscreen will shape how the system evolves," says Hocevar, who built the hardware and programmed its functionality. In addition to the touchscreen itself, the dolphin's habitat at the National Aquarium has been outfitted with equipment to record their behavior and vocalizations as they encounter and begin to use the technology. "We want to monitor whether the dolphins integrate novel elements from touchpad interactions, such as acoustical signals, into their daily repertoire, to which end we have installed an array of underwater microphones and video cameras," says Woodward. Already, the scientists have begun to introduce the dolphins to some of the system's interactive apps, so the animals can explore on their own how touching the screen results in specific contingencies. "Without any explicit training or encouragement from us, one of the younger dolphins, Foster, spontaneously showed immediate interest and expertise in playing a dolphin version of Whack-a-Mole," Reiss says, "in which he tracks and touches moving fish on the touchscreen." This research is funded by The National Science Foundation, The Eric and Wendy Schmidt Fund for Strategic Innovation, and a fellowship from the Raymond and Beverly Sackler Foundation, and it is carried out in partnership with the National Aquarium. "Using methods from statistical physics to analyze dolphin communication will open the door to understand how other animals communicate, which could be a game-changer in understanding how even human language originated," said Krastan Blagoev, the program director for the National Science Foundation's Physics of Living Systems program, which funded the research. "Projects like this not only enable science, but excite the next generation to think about science." The research team hopes that the information gleaned from this research will also result in increased empathy toward dolphins and inspire global policies for their protection.